Jake’s Balloon Blast is a fast moving, fun and lively read for junior primary readers. Jake is immediately likeable and his desire for wanting to fly is something we want all our children to believe in. His creativity and endeavour to do so are original and funny, as is his trusty side and kick and good friend Jonah. There are lessons to be learnt here, but Jake’s family are very fair and understanding, and in the end, laugh in the wake of Jake’s crazy courage. Ken Spillman’s writing is simple, eloquent and very ‘today’ in his choice of ‘junior primary’ language. This chapter book format will suit reluctant readers. The humorous illustrations throughout the book break up the text and add fun and quirkiness. The illustrations compliment this story perfectly. The talented Chris Nixon has drawn the illustrations in a unique grey lead format that is simple yet absolutely delightful. They are realistic snapshots of each moment in this little chapter book and you can see and feel all of Jake’s emotions: dreaming, planning, disappointment, joy, happiness, guilt, remorse and happiness again! The illustrations will definitely resonate and be identified by junior primary readers. The cover will appeal to the targeted readership with its colourful bunch of balloons. 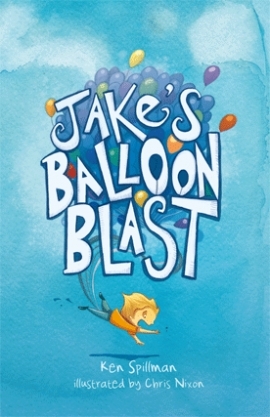 Jake’s Balloon Blast is the third in a series and they have terrific, comprehensive teaching notes that are readily available on-line.